Join us on April 6th for this year’s 24 Hr Roll-A-Thon to benefit Autism Awareness! THIS SATURDAY! CLICK ON THE IMAGE TO PURCHASE YOUR TICKETS! CHANGE DEADLINE: You will have until 5pm the day after registration closes to make any changes to your registration. Once early bird registration ends there will be no refunds, only credits will be issued for future events. BRACKETS/SCHEDULE: The day before the event, we will post both the brackets and event schedule. Note: You will be able to find both the brackets and the schedule on the registration page, website event page, and Facebook Page news feed! COMPETITOR LISTS: Competitor Lists by division and academy can be found on the right hand side of our registration form starting 7 days out from the registration deadline. CHECK-INS and WEIGH-INS: Takes place on day of the event. You must check-in and weigh-in anytime up to at least 90 minutes before your scheduled division start time. You do not have to weigh-in with your gi on. You only need to weigh-in once if competing in several divisions. We ask that you make sure to be present in the venue at least 90 minutes prior your division start time as well in case we are able to get head starts on certain division. $85 for 1 division, $95 for 2 ($10 off during early online registration period). Early weigh ins are AT THE VENUE the night before at 5:30-7:30pm and the morning of the event between 8:00-9:30am. Please be assured that we make every effort to match competitors fairly according to age, weight and rank - including those in the womens 150+ bracket. This seminar has been moved up by a day to TUESDAY, APRIL 10th. We apologize for the inconvenience! If you cannot attend but have already paid, please let us know and we will provide a refund. 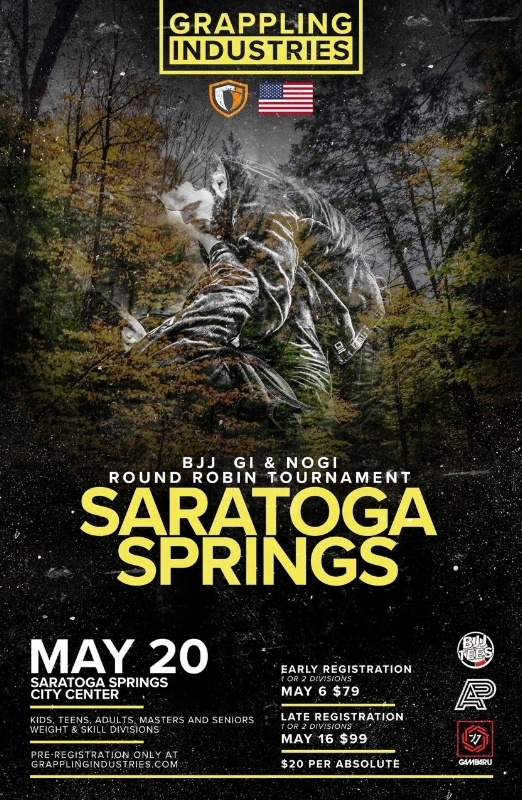 Don't miss this amazing opportunity to train with a legend of Jiu Jitsu! 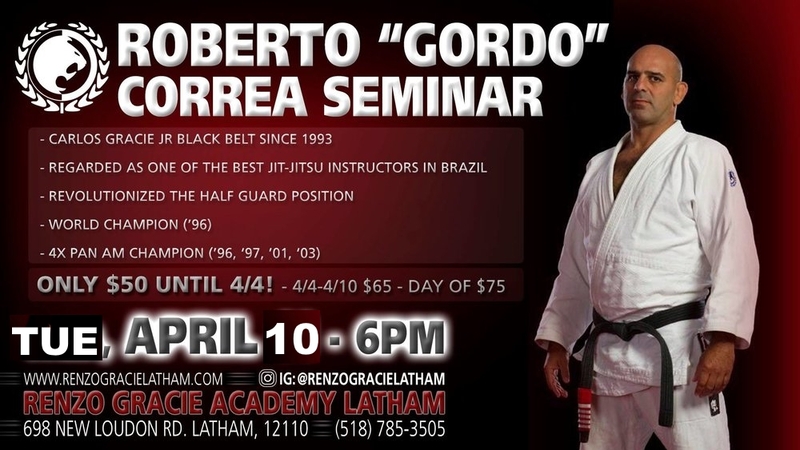 "When he was a purple belt, a defining moment in Roberto Correa’s life occurred. He injured his knee severely, an injury that prevented him from training, but “Gordo” wasn’t convinced and decided to return to the mats prematurely. In order to keep his knee safe, he started playing from the bottom controlling one of the legs of his opponent with his own legs. This was a position he used defensively to keep his opponents from passing his guard. People had “fallen” into this position before, but Roberto started exploring it to his benefit. He was so fruitful that he started training specifically this position even after his convalescence period being extremely successful both in class and in competition. People started calling it “Meia-Guarda” (English equivalent to Half-Guard) a position that became fundamental for any Jiu Jitsu fighter of the modern era. Correa received his black belt in 1993 by the hands of Carlos Gracie Junior, the Gracie Barra president. He went on to have a very successful career as a competitor in the black belt divisions winning every major tournament available and being part of the 2 time World Champion Gracie Barra team of the 1990’s"